As part of its commitment to foster safe and caring learning environments where all students flourish and to create customized approaches to meeting the needs of every student, the San Francisco Unified School District (SFUSD) partnered with Alliance for Girls, the nation’s largest alliance of girls-serving organizations, to implement the Meeting Girls Needs Initiative (MGNI). This initiative focuses on addressing the needs of girls of color in SFUSD. 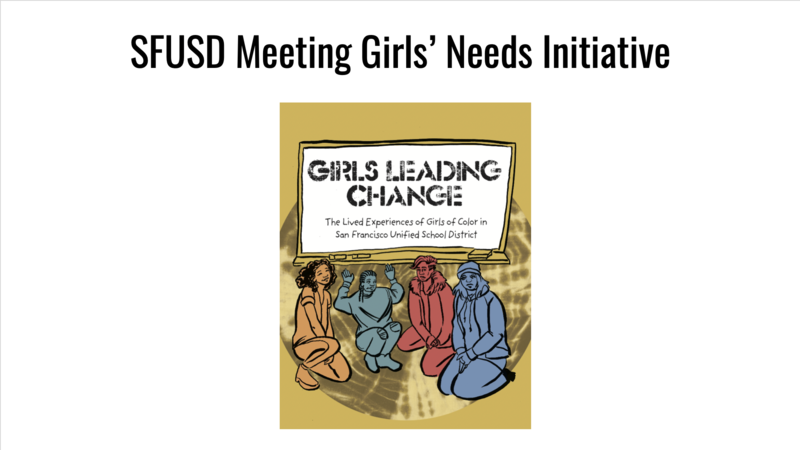 Join our webinar on Tuesday, February 12, 12:30-2:00pm to learn more and engage with the SFUSD Meeting Girls' Needs Initiative. On this webinar, you will have an opportunity to learn about MGNI and the research findings from the Girls Leading Change: The Lived Experiences of Girls of Color in the San Francisco Unified School District report. You will also be able to discuss how your experiences and expertise can inform and advance tangible change through MGNI. If you have any questions or accommodation needs, please contact Livier Gutierrez at livier@alliance4girls.org. We'll make every effort to provide them.